Motorcycle testing and measurement includes a range of more than two dozen statistics giving the specifications of the motorcycle, and the actual performance, expressed by such things as the output of the engine, and the top speed or acceleration of the motorcycle. Most parameters are uncontroversial and claims made by manufacturers are generally accepted without verification. These might include simple measurements like rake, trail, or wheelbase, or basic features, such as the type of brakes or ignition system. Other measurements are often doubted or subject to misunderstandings, and the motorcycling press serves as an independent check on sometimes unrealistic sales and marketing claims. Many of these numbers are subject to variable methods of measurements, or disagreement as to the definition of the statistic. The parameters most often in contention for motorcycles are the weight, the engine output (power and torque), and the overall performance, especially acceleration, top speed, and fuel economy. With electric motorcycles and scooters, the range between charges is often a pivotal measurement. Motorcycle speed tests, especially at high speeds, are prone to variation due to human error, limitations in equipment, and atmospheric factors like wind, humidity, and altitude. The published results of two otherwise identical tests could vary depending on whether the result is reported with or without industry standard correction factors calculated to compensate for test conditions. Rounding errors are possible as well when converting to/from miles and kilometers per hour. With power typically being the product of force and speed, a motorcycle's power and torque ratings will be highly indicative of its performance. Reported numbers for power and torque may however vary from one source to another due to inconsistencies in how testing equipment is calibrated, the method of using that equipment, the conditions during the test, and particularly the location that force and speed are being measured at. The power of the engine alone, often called crankshaft power, or power at the crankshaft, will be significantly greater than the power measured at the rear wheel. The amount of power lost due to friction in the transmission (primary drive, gearbox and final drive) depends on the details of the design and construction. Generalizing, a chain drive motorcycle may have some 5-20% less power at the rear wheel than at the crankshaft, while a shaft drive model may lose a little more than that due to greater friction. Motorcycle rear wheel on a dyno roller. Graph of power and torque. While the crankshaft power excludes these transmission losses, still the measurement is often made elsewhere in the drive-train, often at the rear wheel. A correction for the transmission losses is then applied to the measured values to obtain the crankshaft values. For motorcycles, the reported power and torque numbers normally pertain to the crankshaft. In directive 92/61/EEC of 30 June 1992 relating to the type-approval of two or three-wheel motor vehicles, it is referred to as "maximum engine power", and manufacturers use similar terms. Historically, this convention may have come from the pre-unit construction, wherein the crankshaft was directly accessible for measurements, and the gearbox might have come from a different manufacturer. However, when the engineering details of the transmission are known, the losses therein can be accurately quantified & corrected for. Explicit guidance on the homologation measurements and transmission corrections is given in directive 95/1/EC. A main source of ambiguity and differences comes from the conditions the test was done at. These conditions include details like atmospheric conditions (temperature, pressure, humidity), tire pressure, but most importantly: the conditions of the motorcycle itself. Examples thereof are: was the alternator fitted? ; was the air filter fitted? ; what exhaust system was fitted? One would hope that manufacturers would test their motorcycles in normal running order, so the condition that they are sold in, and for which they obtained type-approval, but this is not always the case. Ducati, for instance, has chosen to publish more positive values, stating that "Technical data referring to power and torque was measured on an engine test stand at Ducati". Their published values are typically 5% higher than the homologation values, in normal running order. Motorcycle weight is expressed in three ways: gross vehicle weight rating (GVWR), dry weight and wet weight. GVWR is the maximum total weight of the motorcycle including all consumables, the rider, any passenger, and any cargo. It is generally well-understood and standardized, being defined by law and overseen by agencies such as the US Department of Transportation. In contrast, wet and dry weight are unstandardized measurements that refer to the weight of the motorcycle without rider, passengers or cargo, and either with (wet) or without (dry) a varying set of fluids such as fuel or lubricants, and the battery. Wet and dry weight are often used to make comparisons between different motorcycles, because all else being equal, a lighter motorcycle will generally perform and handle better than a heavier one. The difference between GVWR and wet weight is how much the motorcycle can safely carry, including the rider, and any passenger and their cargo and other accessories. This is especially of interest in touring motorcycles because the greater the difference between GVWR and wet weight, the more gear and supplies may be brought. As its weight changes during riding, the dry weight of a motorcycle typically excludes the gasoline (or other fuel). Dry weight, in this sense, can directly be used for comparison with (FIM) weight limits, which pertain to the motorcycle in operating condition. It is also part of the homologation tests, and it is found on the EC Certificate of Conformity as unladen mass. This dry weight could also be useful in comparing different models, with different fuel tank capacities. However, manufacturers may also exclude some or all of the following: engine oil, coolant, or brake fluid, and this makes such a comparison difficult. Obviously when any of these is excluded, the specified dry weight no longer pertains to the motorcycle in running order, and thereby becomes misleading. Some manufacturers even exclude the battery, but as the weight of the battery is mainly in the lead, this is even more misleading. So there is no standardized way to test the dry weight of a motorcycle. Inconsistencies may be found between a motorcycle manufacturer's published dry weight and motorcycle press and media outlet's published dry weight. This is due to different testing techniques, mainly differences in what is being excluded, and a lack of defining how the test was done. A battery is typically included in the dry weight by manufacturers (with the exception of at least one), but it may not be included by media outlets. On the other hand, some press and media outlets only exclude fuel to define their dry weight. For a typical sport bike, the difference between wet weight and manufacturer claimed dry weight is around 70 lb (32 kg). This difference includes around 30 lb (14 kg) of gasoline, 7 lb (3.2 kg) of engine oil, 7 lb (3.2 kg) of coolant, and 9 lb (4.1 kg) of battery. These weights are even larger for bigger motorcycles with higher capacities, and attempting to compare the dry weights of air-cooled versus water-cooled motorcycles can be even more misleading. While its weight is quite small, and hydraulic fluid is not strictly speaking a lubricant, it is a liquid that might be excluded during shipping. It is not safe to assume that it is either included or excluded in the dry weight. Hydraulic fluid might be found on a particular bike's front brake and reservoir, plus maybe a rear brake with a reservoir, and maybe also in a hydraulic clutch with its own reservoir. It may add a few ounces to the uncertainty. Ducati has in the past used the term "Ducati weight", pertaining to a value excluding the battery as well as all fluids, but have since begun using "dry weight" for this. Beginning in 2009, the four major Japanese manufacturers and BMW, began publishing the wet weight rather than dry, usually providing some explanation for what this means. Since then most other manufacturers have followed, in order to comply with EC directives that explicitly state that the values pertain to the vehicle in running order. Honda describes it as curb weight (aka kerb weight) and says this means the bike is "ready to ride." Others say all fluids are included and the fuel tank is at least 90% full. Erik Buell Racing gives "Wet Weight (No Fuel)" for the 2012 1190RS motorcycle, while KTM gives a "Weight without fuel approx." The wet weight of a motorcycle includes, but is not limited to fuel, engine oil, coolant, brake fluid, and battery. There is no global standardized way to test the wet weight of a motorcycle. In the EU, Council Directive 93/93/EEC specifies wet weight as "mass in running order", which includes all equipment normally fitted to a bike such as windscreen, tool kit and at least 90% of its fuel capacity. Motorcycle manufacturers will rarely publish wet weight measurements and inconsistencies will almost always be found between different motorcycle press and media outlets. 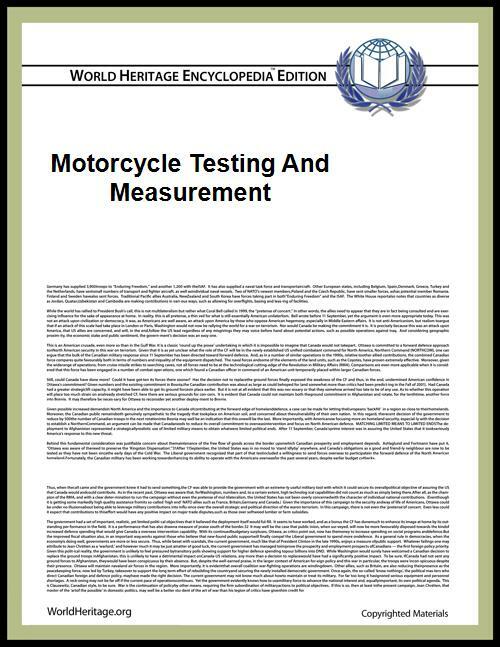 This is due to different testing techniques, differences in what is being included, and by the organization doing the testing omitting an explanation of how they weighed the motorcycle. Cycle World has published wet weights with all consumables on board, but only half a tank of fuel, while Honda has recently published specification tables that use the typically automotive-oriented term curb weight, and stated that it included full fluid levels and the bike was "ready to ride." The following have been commonly used at one time or another to describe motorcycles. Not all of them apply to every motorcycle, and most sources publish only a subset of this list, while others have unique measurements not seen elsewhere. Oil capacity Typically applies to 2-stroke bikes with a separate oil tank. Commons has media related to Motorcycle testing.